When Cheryl Dotz was finally told she had multiple sclerosis, she actually felt a wave of relief. Her symptoms had triggered a menu of tests and led her neurologist to offer some pretty grim possibilities - maybe she had amyotrophic lateral sclerosis (Lou Gehrig's disease) or a brain tumor. "I can live with MS," Cheryl remembers responding to her neurologist after he gave her the news. "It's better than these other diseases you mentioned." Her diagnosis came at a time when she was already under a tremendous amount of stress - just two weeks earlier her son Ryan deployed to Iraq. He was in the National Guard and volunteered to go overseas so another guardsman didn't have to leave his family. Cheryl's symptoms, vague and persistent for years, escalated immediately after Ryan left, and her physician said Cheryl's stress over Ryan's deployment probably caused her symptoms to flare. "I was 57 and probably had MS for many years without anyone knowing," Cheryl said. "I had a lot of tingling in my legs but most of my symptoms were only on the left side. I was very tired and dragging my foot sometimes." Her doctor told Cheryl he didn't think she had MS largely because her symptoms only affected one side. And her fatigue could be attributed to her busy life - a job as a teacher and raising three children. Once she was diagnosed, Cheryl went to a large academic medical center in New York City for treatment. She was given a medication regimen that helped only slightly. She still felt very tired, had numbness and difficulty walking. 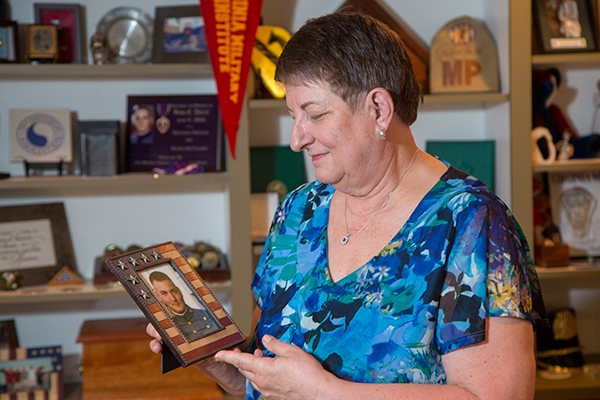 Two months after Ryan was deployed, Cheryl was still struggling with her disease when she got word that Ryan had been killed. She and her family mourned for some time before turning their grief into action, creating the Sgt. Ryan E. Doltz Foundation. In honor of her son, the Foundation gives scholarships to local high school seniors and helps families of deployed soldiers. As a few years passed, Cheryl was still fighting the progression of MS.
"The doctors at the other hospital said I was doing well but I didn't feel well," she said. She started asking people for recommendations for other doctors. The wife of the owner of a bagel shop near her home in Mine Hill, N.J., recommended Dr. Mary Ann Picone at Holy Name Medical Center. The MS Center at Holy Name is one of a select few multiple sclerosis centers in the region to be affiliated with the National Multiple Sclerosis Society. Cheryl has been seeing Dr. Picone now for 10 years, despite the hour drive, two in traffic. "The commute is definitely worth it," she said. "I recommend her to anyone who asks about MS. And everyone at Holy Name's MS Center is so responsive. The support is great â€“ you can call with questions or problems anytime." Dr. Picone started Cheryl on new medications and her overall well-being improved dramatically. Her strength returned and her symptoms are much less severe. "Dr. Picone is very good - any time there is a new therapy or medication she knows all about it," Cheryl said. "Now, I can walk long distances. I just use a cane so I don't look like I'm wobbling, as my daughter calls it. But I am able to do so much - I can walk through the mall and recently went into the city to see a Broadway show. I feel so much better."